What is Securitization? 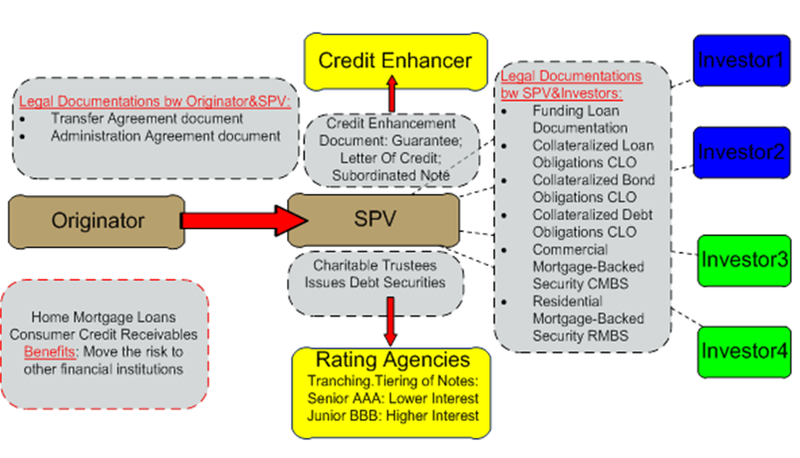 Securitization is defined by some as the financial practice of pooling various types of contractual debt such as residential mortgages, commercial mortgages, auto loans or credit card debt obligations and selling said consolidated debt as bonds, pass-through securities, or Collateralized mortgage obligation (CMOs), to various investors. The principal and interest on the debt, underlying the security, is paid back to the various investors regularly. Securities backed by mortgage receivables are called mortgage-backed securities (MBS), while those backed by other types of receivables are asset-backed securities (ABS). The basic classical transaction is as follows: an owner of receivables (the originator or seller) sells receivables to a third party (the purchaser or special purpose company or SPV). The purchaser borrows money to finance the purchase price and repays the borrowing out of the proceeds of the receivables bought by it. Hence the traditional securitization is essentially a sophisticated form of factoring or discounting of debts. The term securitization is used because in substance non marketable assets-the receivables- are converted into marketable assets represented by securities-the notes: the lenders can sell their notes secured on the receivables. The main purpose of securitization is to move the risk of their assets from their balance sheet to other financial institutions such as banks, Insurance companies, and hedge funds. Securitization started by home mortgage loans and commercial property loans. In fact, any kind of Asset can be securitized such as consumer receivables, trade receivables, oil and gas properties, equipment leases, sovereign debt, delinquent tax receivables, bond portfolios and government revenues. 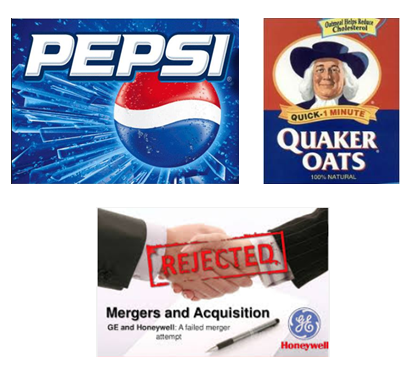 Case studies of GE acquisition of Honeywell and PepsiCo Acquisition of Quaker Oats. New Corporate strategy embarked in 1997. Between 1997 and 1999, CEO Roger Enrico spun off KFC, Taco Bell, and Pizza Hut as one independent publicly traded company and entered additional snack and beverage categories with the acquisitions of Cracker Jack and Tropicana. August, 2001: PepsiCo Acquire Quaker Oats. The acquisition combined PepsiCo’s 13 brands with Quakers market leading Gatorade sports drinks, granola bars, and hot breakfast products. PepsiCo Chief Managers anticipated that by 2004, the inclusion of Quarker Oats brands in PepsiCo’s portfolio would also increase annual operating cash flow by $4B and improve ROI by 100 basis point per year to reach 30% by 2005. The market had reacted favorably with the value of its common shares improving from $30 in 1997 to over $45 in 2001. During this project, we assessed the Pros and cons of the acquisition starting by SWOT analysis. Then we conducted a strategic plan for PepsiCo for 3 years covering Divestiture, Unrelated Diversification, Horizontal Integration, Product development and Market Penetration. Dilema of GE’s attempt to acquire Honeywell:General Electric announced in 2000 it would attempt to acquire Honeywell; at the time, Honeywell was valued at over $21 billion. The merger was cleared by American authorities but was blocked by the European Commission’s competition commissioner, Mario Monti, on July 3, 2001. This decision was taken on the grounds that GE’s dominance of the large jet engine market (led by the General Electric CF34 turbofan engine), leasing services (GECAS), and Honeywell’s portfolio of regional jet engines and avionics, the new company would be able to “bundle” products and stifle competition through the creation of a horizontal monopoly. US regulators disagreed, finding that the merger would improve competition and reduce prices; United States Assistant Attorney General Charles James called the EU’s decision “antithetical to the goals of antitrust law enforcement”. The research detailed the stages of the acquisition attempt and the outstanding role Jack Welch played during the negotiations.